Moses had been such a tremendous leader for the Israelites that, upon his death, the load that his successor was left with would certainly be terrifying. For 40 long years Moses had been there for the Israelites, leading them, guiding them, advising them, interceding for them, commanding them – it was in the time of Moses that structures were established and laws were made common. Joshua, his successor, though not new to the leadership role, was suddenly thrown into the spotlight. The time of Moses has now passed them by. His step into the main leadership role of the Israelites signified a new era for his people. First and foremost, God personally instructed – or should I say, assured – Joshua in Joshua 1:2-9. 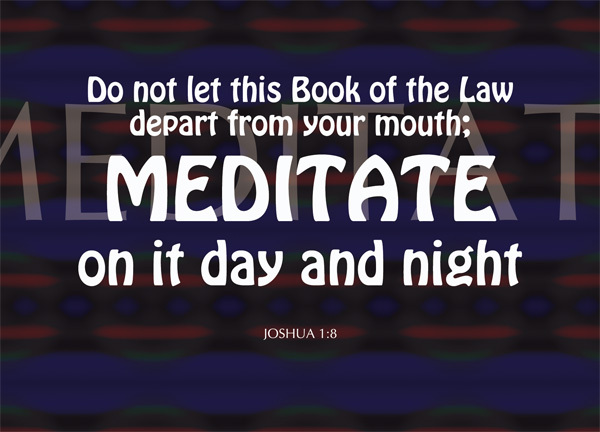 On top of instructions on where to lead the Israelites to, the Lord also had instructions for Joshua himself – for his own personal growth – to meditate upon the Book of the Law day and night. In doing so, God promises that he will be prosperous and successful. meditate on it day and night – if the previous phrase makes the point unclearly, this phrase hits home immediately. If you do not immediately think about memorizing God’s words – or reflecting on God’s words – in the previous phrase, surely you must be reminded of that in this phrase. But his delight is in the law of the LORD, and on his law he meditates day and night [Psalm 1:2] – to think about something day and night is hard enough, but to meditate on it – with perhaps the element of praying suggested – but as Psalm 1:2 reads, if we delight in it, then, to meditate day and night on it is nothing hard. so that you may be careful to do everything written in it – Why should we meditate on the word day and night? We are provided with a sound reason – it’s not for no good reason, of course. We can understand the verse this way – the first part makes it easier for us to perform the second – by not letting the Book of the Law depart our mouths, we’re essentially forced to think and meditate about it constantly, and by meditating on it constantly, we’ll naturally be more inclined to perform what it teaches. Try telling yourself ‘smile when you see somebody’ a hundred times and walk out of your room. Chances are, you’ll smile when you bump into somebody without even having to think. (Okay, maybe not, but that’s just a good suggestion to start your morning.) For it is not those who hear the law who are righteous in God’s sight, but it is those who obey the law who will be declared righteous [Romans 2:13]. The law doesn’t ask us to kill and curse and gamble and sin. The law is good and righteous, God’s words bring us good and make us righteous. We’re asked to do everything written on the Bible carefully. Intentionally. Then you will be prosperous and successful – Following the line that I started previously, by performing what the word teaches, we are basically doing good and being righteous, and that will eventually lead to us being prosperous and successful – in God’s own way, of course. It doesn’t necessarily translate to what humans perceive as prosperous and successful – i.e. being a millionaire, becoming the CEO; or things like that, but surely in Joshua’s time it meant being rich in the spirit, and perhaps having a lot of offsprings even; and fulfilling the role left behind by Moses successfully. God knows our worries. God understands our fears. He has already prepared a method to tackle our worries and to curb our fears for us. Even the bravest man would be apprehensive and hesitant in the face of such a big job to take, like Joshua. Even if he relished the challenge, there are still things to be worried about. Before he had the chance to voice his worries, God had already spoken. Read my word day and night, God instructed. Read it to the point of memory, so that you’ll act as it teaches – act as I taught. Because by following my precepts, you will be doing the right things, and hence you will succeed in your new role. Our circumstances and our personalities are perhaps vastly different from Joshua. We don’t have a huge nation – a new nation – waiting for us to lead, waiting for us to bring into the promised land and to begin an entirely new era. But the method to fight our concerns and our doubts is still unchanged. Joshua 1:8 applies to us just as much as it was crucial to Joshua. I know you’re busy, but I still think you should collect all your posts into one downloadable e-book that churches can use to decorate bulletin boards or whatever they want (send in newsletters, post of Facebook). You can make it donation optional.